After I finished laughing I realised this it telling about our online conversations and being defensive as default. I noticed a general downwards trend in the quality of online comments. Glad to see this. There has a been consistent drift to twitter & other social for comments. 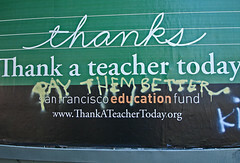 I think this is a pity for several reasons. I am responding to this with a webmention, which it looks like you have adopted. I’d hope that the quality of comments received via webmention might be better given that the comments will be published on the commenter’s own site. These might be less knee-jerk or throwaway than a tweet or toot? There are still a few wrinkles to be ironed out of webmentions but I have high hopes that they will be more widly adopted and be a good thing. P.S. If comments are the cassette tape of the digital world, not sure what metaphor you would recommend for a comment syndicated from your own site? 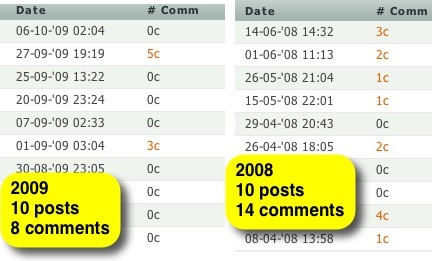 Fascinating post Aaron, and an great example of why comments, linking and blogging. Just starting to follow the links in this comment took me into both familiar and new; people, places and ideas. Just on the comment quote, your post, a comment exemplifies the power of commenting from your own site. A comment on Tom’s would probably have tripped the too many links flag for spam detection. I do wonder how you approach commenting on sites with out webmentions, like Tom’s? Do you regard them as notes to yourself and your readers rather than replies? It is not just me. I’d noticed this and assumed it was something I’d done. However, this is causing me a bit of frustration because it feels as though the conversation about a post is happening on Micro.blog rather than on people’s own blogs. Here I get the text from comments on micro.blog replies and from replies to that reply. Colin’s blog only seems to get a link to micro.blog. I am not really sure how it is all glued together. The final piece would be to be able to join the micro.blog thread from the comments here, that might be a technical step too far? There are a lot of interesting and powerful parts of this post by Audrey Watters but this interests me in all sorts of ways. Thinking from the pov of a teacher working with primary pupils I’d want the ease of posting comments for pupils to continue, but if that could be done on their own space, with the option for some sort of universal trackback notifying the site commented on it would be really interesting. This of course links in to my reading around POSSE & the indieweb. The whole post addresses much more important issues and I recommend it highly. There has been a fair bit of comment recently on how twitter is taking over from blogging and commenting on blogs. My own blog has never had a high number of comments, but the number has dropped. Recently I’ve noticed that posts are tweeted and retweeted, but not commented on. Every so often I try to up my own commenting, without posting ‘me too’ or suchlike and to keep track of the comments I make. In the past I’ve used coComment, but found it did not always work for me and sometimes reports posts have new comments when they do not. I’ve also just bookmarked the posts I comment on in my browser, but that gets a bit messy and is not portable. So I’ve come up with the following solution, it uses AppleScript so is a mac only method, but I am sure someone could do, or has done the same sort of thing with greasemonkey for firefox. It consists of two simple scripts, the first based on one called @review (I think) that I downloaded a few years ago and can’t find a reference to credit. This script takes the current url in Safari and posts it to delicious tagging it with @comment and making it private. The private part is to stop the links showing up in my RSS feed with my other links. The script: @comment.scpt.html is pretty simple, and uses the delicious API. I run both of these scripts from FastScripts. 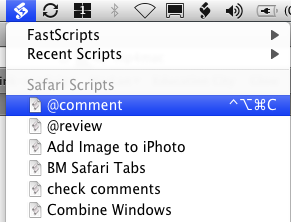 FastScripts is a replacement for the mac’s Script menu. It lists scripts, current application at the top, and allows you to add keyboard shortcuts. So my @comment script is invoked with control-alt-command-c which is easy to hit. I just post a comment and hit the key combination, growl notification is built into the script and lets me know if the submission to delicious was successful. The scripts can be copied and pasted into the Script Editor if you want to use them, all you need to do is add your username and password to both and get the private delicious RSS feed url. I would be interested in finding other ways of keeping track of conversations, so please let me know if you have a good way. I just posted a comment on Dangerously Irrelevant: Know a great commenter? listing just a few of the folk who have really made their mark on the Sandaig blogs. There are of course a great many more. All make a great deal of difference to the children here we own them many thanks.